IT’S hard to imagine that just seven months ago the Boddington fires ripped through Lower Hotham in the shire of Boddington. 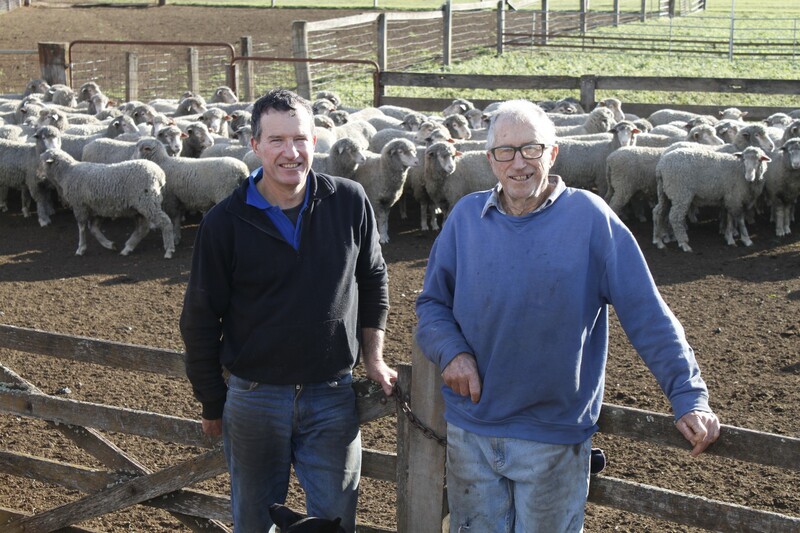 Father and son farming duo Tony and Wayne Littleton lost hundreds of hectares of pasture and kilometres of fencelines but luckily just a handful of their Dohne ewes and lambs. When Farm Weekly visited last week the pair were just a couple of days into their 10 day or so lamb marking period. At the end of the first day Tony and Wayne came to the conclusion that their maiden ewes hadn’t performed as well as expected and put it down to the fact the flock was forced to run in a bigger mob than it had ever done in the past. The Littletons were forced to box up their sheep halfway through the mating season just moments before the fire swept through the valley. The constant presence of fire units and water bombers for days on end meant the maidens went off the boil pretty quickly. Father and son duo Wayne (left) and Tony Littleton in front of a tail end draft of red tag Dohne wethers ready for sale. But none of that matters, because despite the fact all their boundary fences were laid or burnt flat, everybody and everything was still alive. 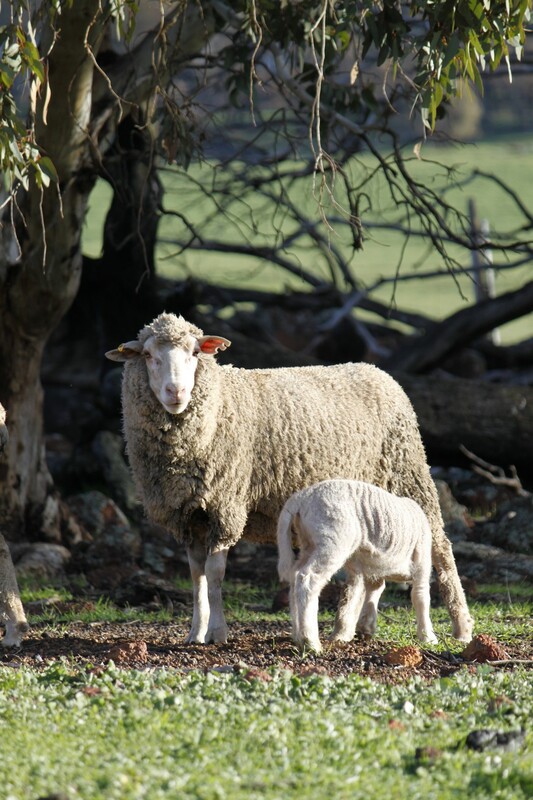 As one of the very few commercial Dohne producers in the Hotham Valley, near Quindanning, Wayne and his parents Tony and Emily credit the Dohne breed for their flock’s relatively quick bounce back. Tony’s father started the farm in the 1930s. A railway worker with no farming background, he was being sent to work in the country and decided if he was going to do so he would do it on his own terms. Tony’s father kicked thingsoff with a 50:50 split of Merinos and Corriedales which morphed into a Merino and F1 Corriedale-Merino cross flock once Tony was old enough to take over the reins. Following that Tony and Wayne introduced Suffolk rams to the mix – putting them over a proportion of their Merino ewes in order to sell lambs into the prime lamb market. Dohne flock since about 2010. It was a gradual shift to Dohnes that started when the Littletons read a story about the breed in Farm Weekly before it was popularised by a string of WA-based studs. Tony and Wayne bought a handful of rams advertised in the paper’s classified section and haven’t really looked back. Their first and second crosses weren’t very successful due to the fact the farm’s existing Merino ewes weren’t very compatible because of their wool type. That hurdle was somewhat easily crossed by selecting the farm’s better ewes to be mated to Dohnes. These days the Leach family’s Glenlea Dohne genetics from Katanning run throughout the farm’s Dohne stock. Some 2700 ewes were mated this year – rams go in for six weeks in the second week of January for a mid- June lambing. The large majority of wethers are sold as lambs each year except for a tail end draft that the Littletons are preparing to sell. Like most WA sheep producers Tony and Wayne also play the market when it comes to sales rather than working to a strict selling regime. They’ll sell to whichever business comes up with the most cash, including selling lambs to a number of the State’s butchers before Christmas and a few lines of older sheep to the shipping market. Wayne said his family turned to Dohnes rather than Prime SAMM in the initial stages of the flock re-build because his research suggested it was supposed to be the better dual purpose sheep as far as wool and meat attributes go. main shearing in March. Lambs, a few culls and the wethers are shorn in December. “As far as the season goes, it was pretty tough earlier on this year,” Wayne said. “We lost a lot of paddock feed and we were pretty short on supplies. “Considering that, the lambs have done alright. “What we’ve marked so far have been as big as at the same time in any other year.” Tony and Wayne run their ewe mobs at about 13 dry sheep equivalent thanks to their ability to produce good feed in most usual seasons. The Littletons also put in an oat crop each year for sheep feed and sell the surplus seed to assist with cash flow, which sees a 75:25 split of sheep to crop. The farm’s self-sown pasture base is clover and any paddocks that have been in crop for two or three years get sown back to clover. An example of the Littleton family’s maiden Dohne ewes and lambs.